A severely damaged or decayed tooth may create cosmetic imperfections, become a source of sensitivity, or lead to significant pain. Porcelain crowns are designed to reinforce and restore the structural integrity of a tooth, while preserving as much of the natural tooth structure as possible. With this procedure, Beverly Hills cosmetic dentist Kevin Sands, DDS can often prevent the need for a tooth extraction. When a root canal is necessary to improve the health of the tooth, a porcelain crown can be used to strengthen the tooth structure, while also rejuvenating its appearance. A porcelain crown may be the ideal solution for patients who seek to restore both the function and aesthetics of a damaged or decayed tooth. I was playing football with my friends, and caught ball in my face, knocking our one of my teeth. I looked like one of those people in cartoons. I made an appointment with Dr. Sands, and he said he could replace it with an implant crown. I was worried it might not look like the rest of my teeth and I end up looking ridiculous since it was one of my front teeth that was lost, but I was worrying for nothing. The implant crown looks just the rest of my teeth, in shape and color. Dr. Sands is great and does excellent work. During the consultation process, Dr. Sands will perform an oral examination, review your goals, and determine if a porcelain crown is best suited for your unique situation. Each porcelain crown is custom-made to deliver maximum function, an optimal appearance, and comfort. 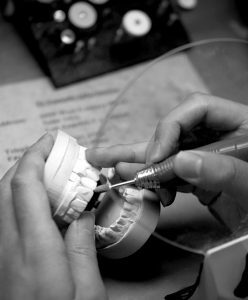 After creating a mold of the affected tooth, Dr. Sands will order your custom crown from a dental restoration laboratory. The color of the crown can be made to match the shade of your surrounding teeth for a natural appearance. When he receives the crown from the lab, you will return to our office where Dr. Sands can cement the final crown into place. Once the crown is bonded to the affected tooth, the form and function of the tooth will be fully restored. On average, custom-crafted dental crowns made from high-quality ceramic material can cost between $1000 and $3000 per crown at top cosmetic dentistry practices in the Los Angeles and Beverly Hills area. The exact price for your crown, however, will depend on a variety of factors that influence pricing. Ultimately, your estimate may be more or less than the average price range we’ve listed here. After your consultation, you will receive an itemized quote for the full cost of your care. You will also have the opportunity to learn about the payment options we accept and financing plans that are available through CareCredit® and Enhance Patient Financing. If you have questions about prices or financing, we encourage you to contact our practice to speak with a knowledgeable member of our team. If you are suffering from a damaged or decayed tooth, or would like to learn more information about porcelain crowns, please contact Dr. Kevin Sands today.